If it cannot be bought, it must be built. Behind the scenes of any successful voyage is a mountain of preparation. The 2014 exit of the Northwest Passage is no exception to that need. And, seeing as the clock never stops ticking, I had a few important projects that were due. Wedged in between late night overtime, being a dad, fiancé, and building a container home, the opportunities were thin, but enough to get it all done. I began these projects with an experiment. Namely, The Gimbal-mounted Astrocompass! The Gimbal mounted Astro Compass! Sound cool? It is cool! It will be even cooler if it works! When Samantha and I met in the Arctic, one of our first in-depth conversations was about navigation. And for good reason: navigating the Arctic is demanding and challenging. Once beyond Cape Bathurst, our compass was a mere decoration. The fog, the ice and the water each take a separate path…. the coast pilots and Arctic guides are vague and the weather report is wrong, nearly always. But of course this soup of challenge is the song that serenaded us both to Cambridge Bay. Her by the air and me by the sea. Without the skill of navigation, we never would have met. Part of me is purist in this realm. I love hand bearing compasses, triangulation, celestial navigation, pilotage, charts and soundings. But when the odds are stacked against you, it is prudent to use all resources at your fingertips. That’s where radar and GPS come in. But there is something most forget. When the power goes out…so do they. Imagine what happens in a city, when the power goes out. Everything begins to break down, from security and heat, to social controls. The system does not work without power. But it did once. On land and sea. People made their way by flickering candles, hourglasses and skill. So in the keeping of padding the deck in our favor, I acted upon this thought I had: the gimbal-mounted astrocompass. So first. What is an astrocompass? And why would you want to mount it on a gimbal? 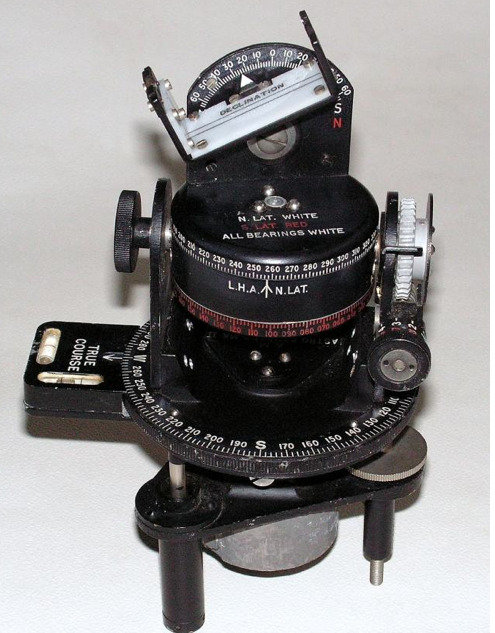 An astrocompass and its use are outlined clearly enough at the other end of this link. In short, it is a non-magnetic device that is used to find True North, and/or the heading of your ship. The device is used in conjunction with the Nautical Almanac (a $20.00 book full of numbers), wherein, the appropriate daily data for the sun, the moon and a select set of stars, are written on its pages. No batteries. No calculator. No paper. No pencil. Just a clear view of the sky. A watch, the Nautical Almanac and a LEVEL astrocompass. Level. That’s where the gimbal comes in. See, the astrocompass was designed for use in aircraft, not ships at sea. At sea, keeping it level could be problematic. Elsewhere in the world, the Isogonic lines were mapped well enough that a compass could be corrected for VARIATION (changes in the global magnetic field) as well as for DEVIATION (magnetic disturbances such as a belt buckle when worn near a compass), making the magnetic compass a reliable navigation instrument for most of the world. In the north, in the region dubbed “the area of magnetic uncertainty”, very little shipping occurred. Once the Northwest Passage was completed by Amundsen, a number of years went by wherein the Passage and its navigation got little attention. 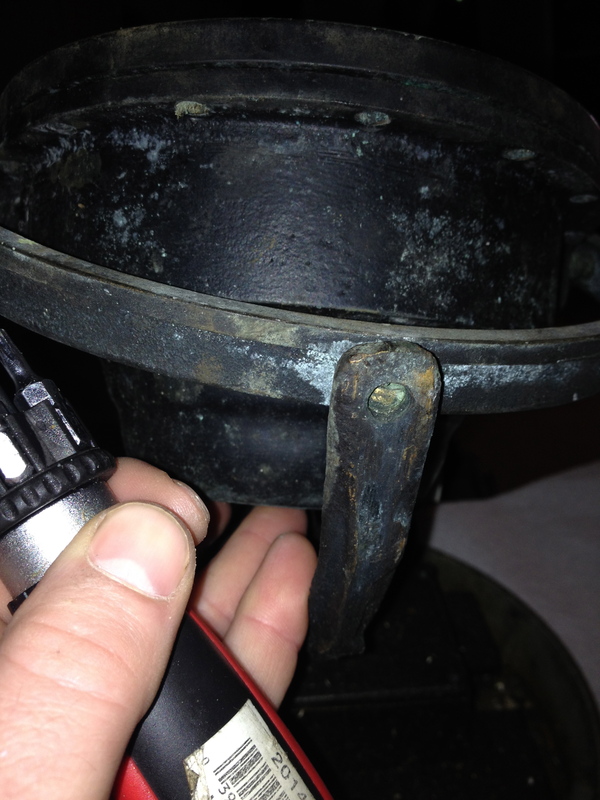 I speculate that this is why the Astrocompass was never adapted for use at sea. Meanwhile as airplanes crept North, the problem of “not knowing where North is” was remedied by the invention of the Astrocompass and Chronometer. 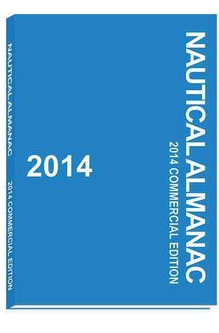 I had researched the astrocompass prior to the 2013 voyage. But buying one was not in the budget. I even called a company that sells them, requesting sponsorship of one unit, to try out at sea. But alas, they declined my humble request. They counter-offered that I could purchase one from them, for full purchase price, whenever I liked. I thanked them for their time and hung up the phone, then gazed over my budget while chewing my lip. Returning to my “to do” list, I read: “Try to score astrocompass from xxxxxxx as sponsorship.” I put a big fat scratch down that line, accepting that the astrocompass would not be along this voyage. The good news was that my “to do” list was one line shorter. I put the astrocompass out of my mind. Fast-forward six months. I’m in Cambridge Bay, discussing navigation with a beautiful, smart, fun bush pilot, who happens to own an astrocompass. What a woman! After falling in love for many reasons not unlike this one, Samantha came to visit me in Alaska. She brought her astrocompass and left it with me to use. I took it with me to the North Slope, where I was working at the time. On clear nights, I would drive around the work yard, taking sights through the frosty windows of a pickup truck. I was able to find my heading, with amazing accuracy, using only the moon as my guide. To the workshop I went. Browsing metal scrap and devising a plan to hold this magical device level at sea. I did not have time to finish the gimbal on the North Slope. So I flew home with plans in my head and a few parts in the making. 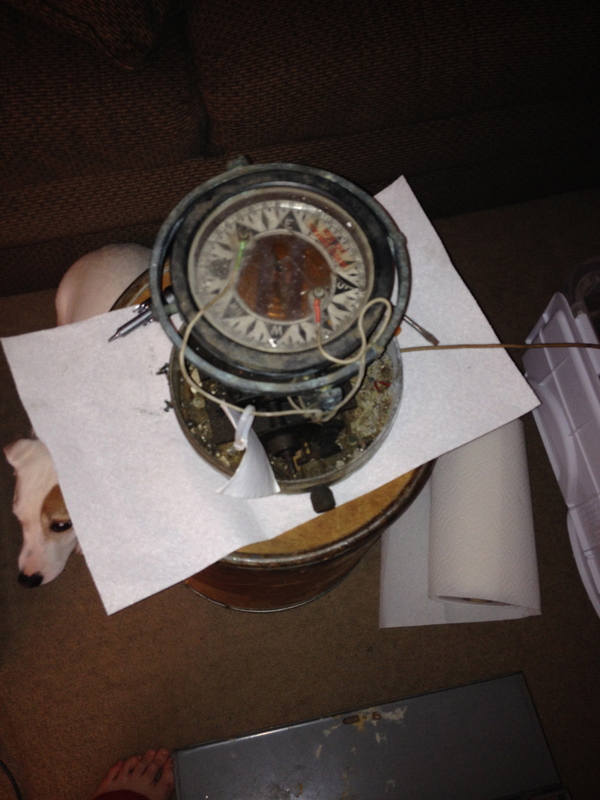 Once back in Seward, I was clearing out our storage for the move and came across this gimbaled compass. Then and there, its future was defined. 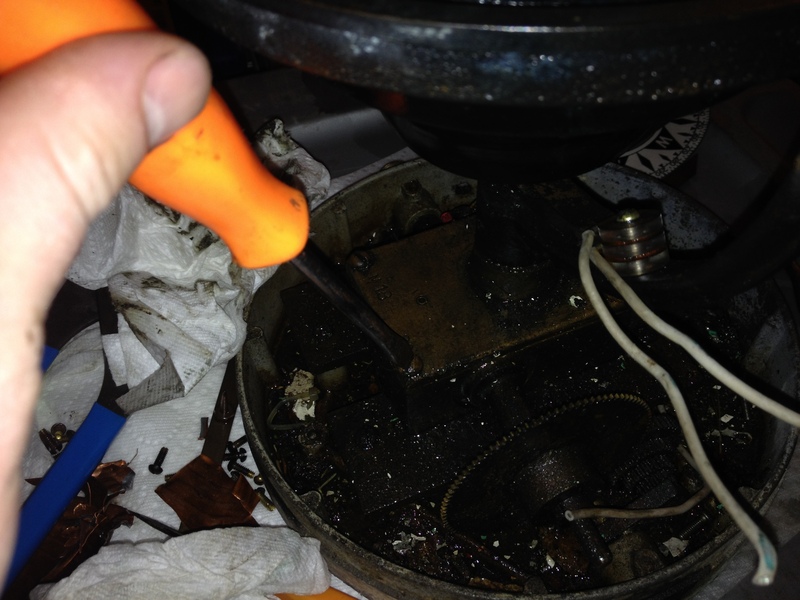 I took the compass home and began disassembling the unit. 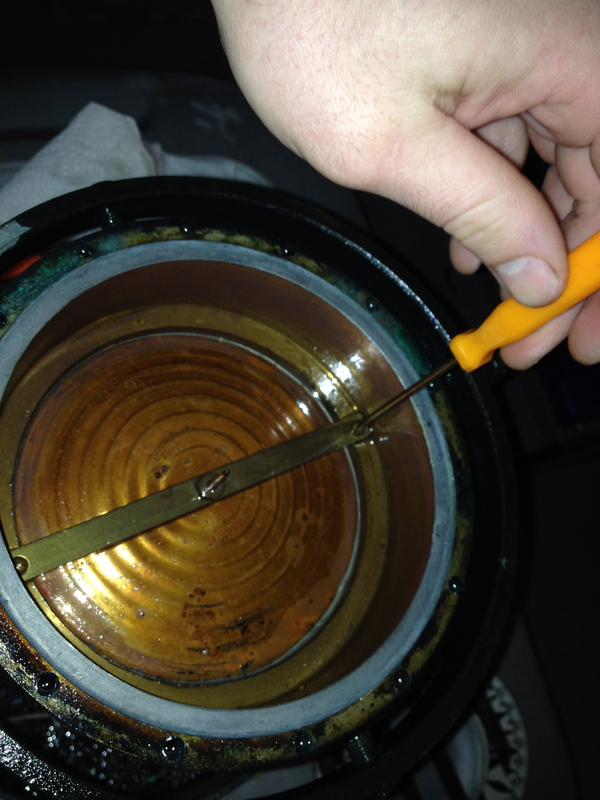 I drained the mineral oil, removed the ring, card and guts. 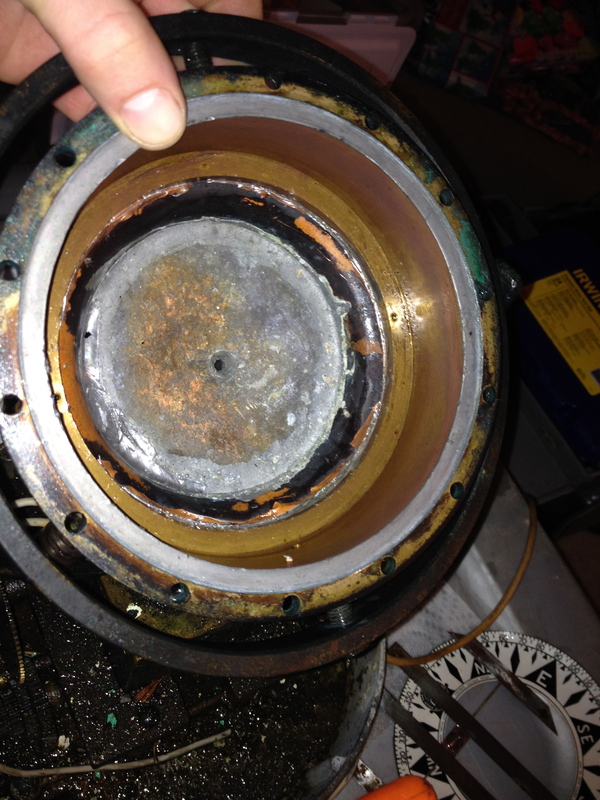 Under all that I found a copper false bottom that held the oil. I cut that out and folded down the edges. 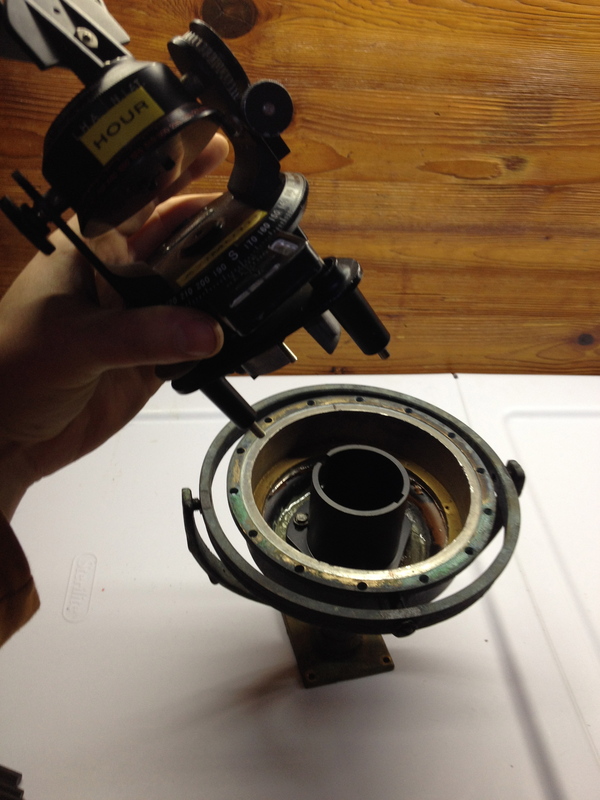 I ordered an astrocompass mount from company XXXX and mounted it inside the gimbal dish. Before installing the mount. 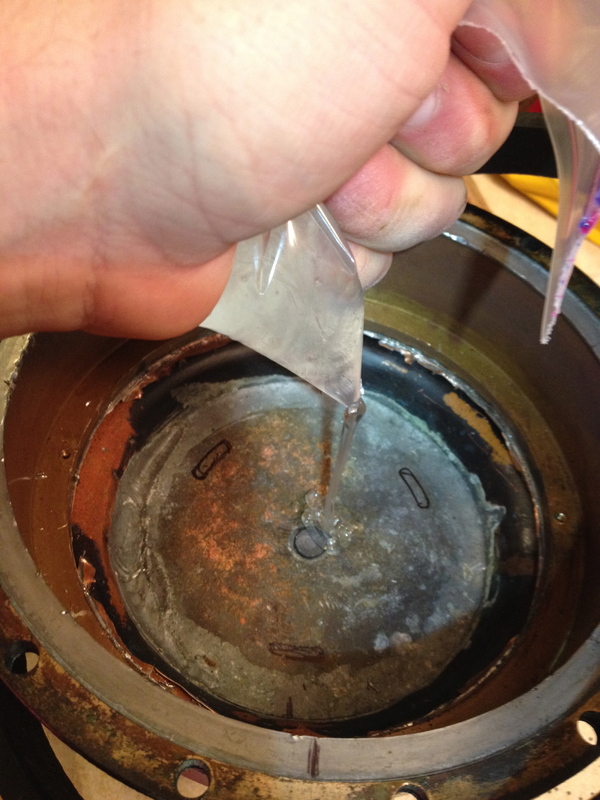 I set the dish on a level surface and poured a mixture of epoxy inside. 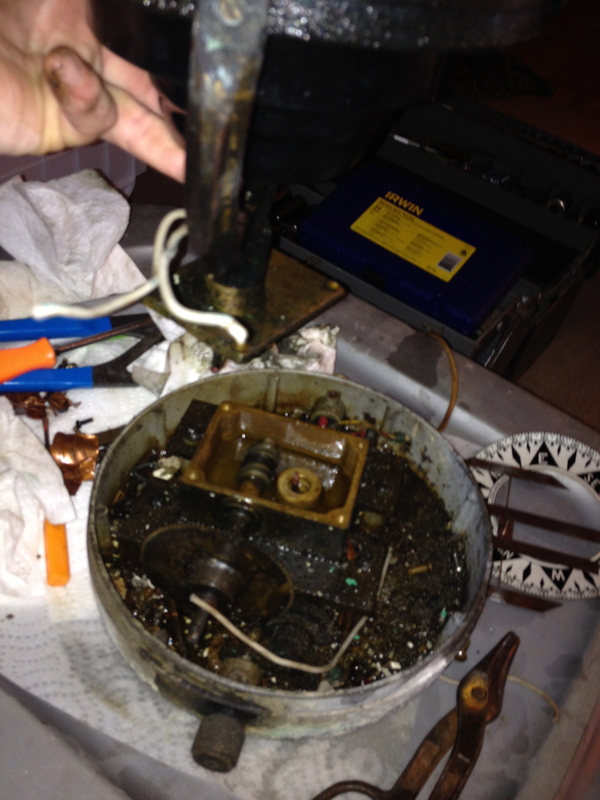 This hardened, level with the world and provided a good base to drill and screw down the mount. 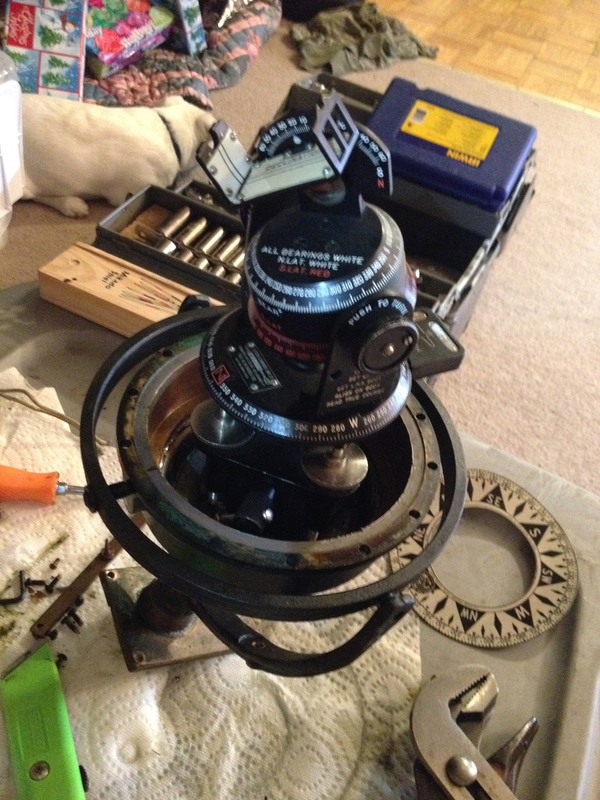 I installed the mount and set the astrocompass in place. Once the gimbal is in action, fine tuning can be done with the thumb screws on the device. 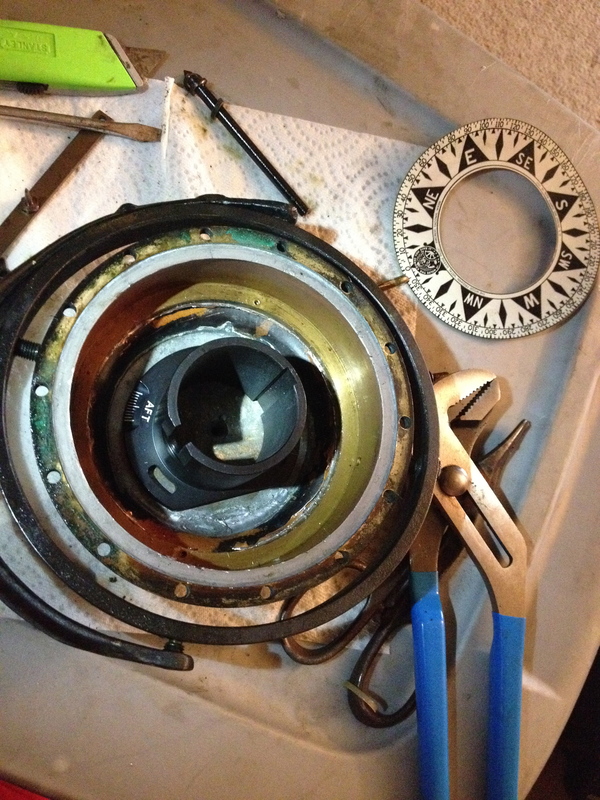 Once the gimbal was complete, I modified some gear box parts to create an on deck mounting socket. So the whole works can be stowed below. 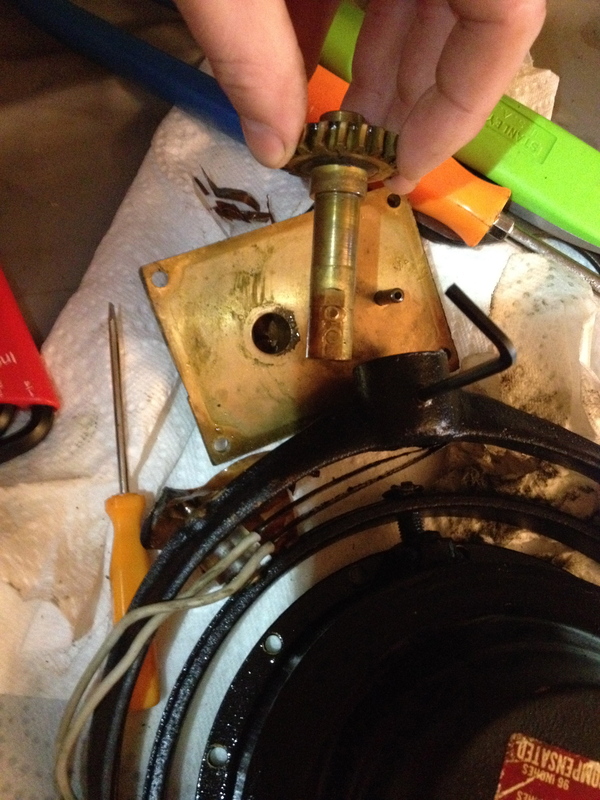 Mounting socket and spindle from gear box parts. There you have it! 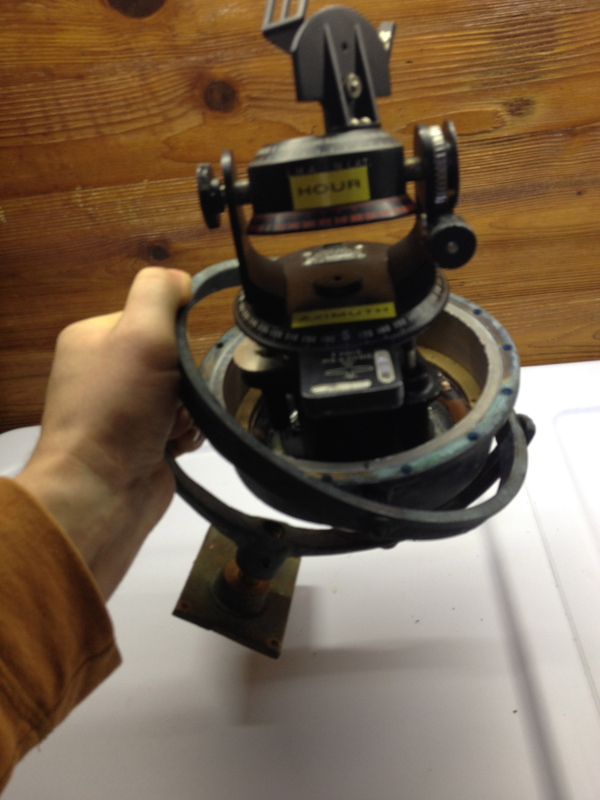 A level astrocompass, modified for the sea. I really enjoyed this project. It got my mind spinning about the North and kept the voyage of 2014 on my mind. I learned a lot in the process, while scratching out lines on my 2014 checklist, without denting the budget.